← Everyday Witch Tarot – Deborah and I Finally Meet! 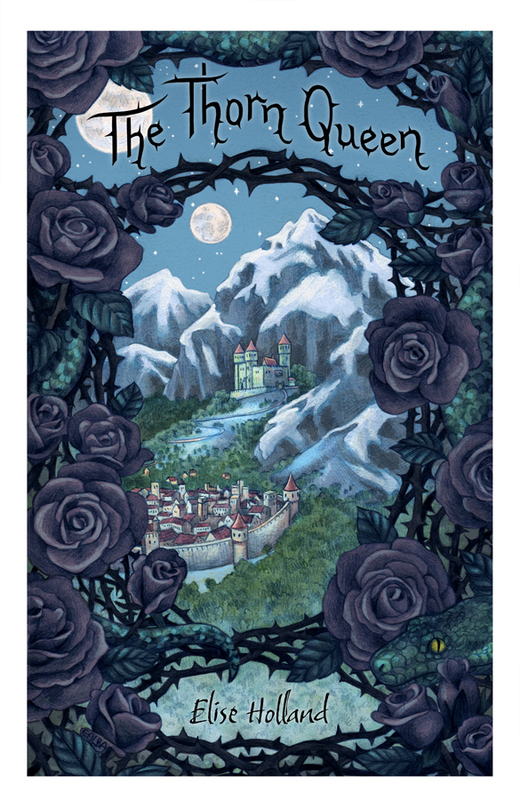 For the past few years I have been working with an author, Elise Holland, on her middle grade novel The Thorn Queen, at www.whyismud.com. I’ve posted about it before – I completed some illustrations for the design of the website, and have been illustrating the chapters as they’ve been published online. I recently revamped the book cover, which is what I’d like to share with you here! Click the image to see a larger view! I wanted to keep the style consistent with the other images I made over the years for the website, so the image is a pencil drawing colored digitally. Elise and I wanted an image that would invite the reader into the world of Glendoch, but with a hint of menace! Definitely check out the book – it’s a lot of fun! Hidden to most, this glacial world once crackled with beauty. Now it waits for war—divided and bound by strict rules. So when twelve-year-old Meylyne trespasses in the Above-World and falls from a tree on Glendoch’s sickly prince, she must flee or face imprisonment in the Shadow Cellars. She is convinced she will perish, yet with the help of her friends she inches her way back home … until the day she collides with the Thorn Queen. And home just got further away than ever. This entry was posted in artwork, book covers and tagged book cover, castle, digital, efk lasalles, elise holland, fantasy, fantasy world, middle grade, pencil, snake, the thorn queen, why is mud. Bookmark the permalink.